Many people who are tired of wearing glasses or contact lenses seek the help of refractive surgeons. Refractive surgery improves vision by correcting refractive errors such as nearsightedness (myopia), farsightedness (hyperopia) and astigmatism. Myopia, also known as near-sightedness and short-sightedness, is a condition of the eye where the light that comes in does not directly focus on the retina but in front of it, causing the image that one sees when looking at a distant object to be out of focus, but in focus when looking at a close object. Hyperopia or hypermetropia, also known as farsightedness, is a defect of vision caused by an imperfection in the eye (often when the eyeball is too short or the lens cannot become round enough), causing difficulty focusing on near objects, and in extreme cases causing a sufferer to be unable to focus on objects at any distance. 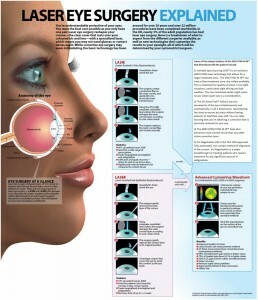 LASIK is the most common laser eye surgery. LASIK starts with the creation of a thin flap in the cornea. Your surgeon uses a blade or a laser to make this flap. Once the flap is created, the excimer laser is used to reshape the cornea, which corrects the refractive error. PRK is the second most common type of laser eye surgery. PRK starts with the removal of a portion of surface of the cornea or epithelial tissue. There is therefore no need for flap creation, and the removed tissue grows back. Some patients prefer PRK because they don’t want a corneal flap, and some patients are better candidates for PRK eye surgery than for LASIK (for instance, people with thin corneas). Once the epithelium is removed, a laser is used to reshape the cornea. The laser is the same (i.e., excimer) as the one used in LASIK. The PRK recovery period is a bit longer than that of LASIK. Your ophthalmologist should be able to determine from a comprehensive, laser-eye-surgery-specific eye exam which procedure is best for you. His recommendation will follow which procedure he thinks will give you the best possible outcome. Most patients achieve 20/20 or better vision after laser eye surgery. 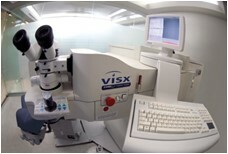 The VISX Star is the first choice for refractive surgeons. There are more VISX systems used in the United States than all other competing laser platforms combined. That market dominance continues to increase as AMO-VISX continues to introduce additional advancements and technical innovations. AM I A CANDIDATE FOR LASER VISION CORRECTION SURGERY? Candidates for Laser Vision Correction should be 18 years or older with stable vision, healthy eyes and a prescription that falls within the range of effective treatment. In some cases, such as CustomVue™ (Wavefront -Guided) treatments patients should be 21 years of age or older. You will need an initial evaluation, followed by a comprehensive eye exam to help you and your doctor decide which procedure is right for you. Laser Vision Correction can benefit a great number of people with myopia, hyperopia, and astigmatism. Candidates should have a strong desire to be less dependent on corrective lenses and willing to accept the risks of surgery. No, the procedure is painless. Anesthetic eye drops are placed in the eye to numb it. Most patients say they feel some pressure during the procedure, which only lasts a few seconds. After the procedure you may have some light sensitivity, tearing or “burning” in the eyes, which should subside after a few hours. These symptoms are temporary. Most patients will notice improvement in vision immediately following treatment. Visual recovery varies for each person, but usually stabilizes at 1 month. The speed at which your vision improves is due to individual healing rates, type of procedure and degree of nearsightedness, farsightedness or astigmatism. Most patients find that their eyes feel fairly normal within a day. 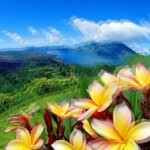 However, vision can continue to improve and best vision can take two to three months to occur. 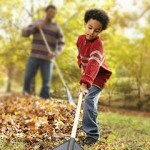 If necessary, enhancements can be done after your vision has stabilized to further improve your vision. Patients who have hyperopic LASIK may have a longer healing process. The whole procedure takes about 10-15 minutes for two eyes. This includes anesthesia to the eye(s), creating the flap and performing the laser treatment. CAN BOTH EYES BE TREATED AT THE SAME TIME? Due to the advanced technology used to perform Laser Vision Correction, both eyes are usually treated on the same visit, one right after the other. DOES INSURANCE COVER LASER VISION CORRECTION? Most vision insurance companies still see Laser Vision Correction as an elective procedure. A few insurance companies have added Laser Vision Correction to their benefits. You can contact your insurance company to determine if your policy contains a Laser Vision Correction benefit. WHAT ABOUT NIGHT TIME VISION AFTER LASIK? 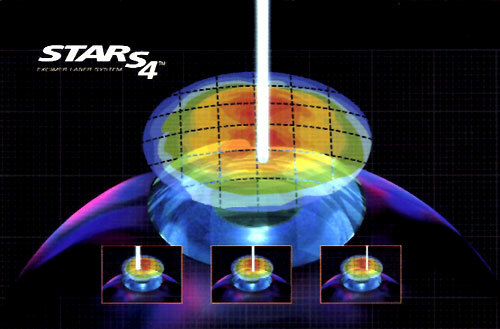 Glare, halos and ghosting (which may become most noticeable at night) were not uncommon side affects of many laser procedures early on with the use of older technology. Most likely, if you did not have any glare, halo or ghosting issues before Laser Vision Correction, you will most likely not have those issues after the procedure. Modern lasers have very much reduced this problem. Ask your doctor about your individual risk. Laser Vision Correction is considered to be a permanent procedure. However, it will not prevent any age-related conditions, such as presbyopia or cataracts. They would need to be treated in the usual manner. CAN LASIK CORRECT MY CLOSE-UP VISION? Typically, after age 40, we develop a condition known as the decreased ability to focus at near. The progressive loss of the accommodative (focusing) ability of the lens is due to the natural processes of aging. Presbyopia usually begins to occur around the age of 40 and is commonly corrected by the use of reading glasses or bifocals. LASIK will not correct your reading vision. LASIK only corrects nearsightedness, farsightedness or an astigmatism. If you wear bi-focals or wear contacts in addition to your reading glasses, LASIK may eliminate your need for bi-focals or contacts but you will still require reading glasses after the procedure. In general, the ideal candidate for LASIK is between the ages of 18 and 55, with stable vision and healthy corneas. Although this is the optimal age range, we have performed the procedure on patients up until age 60. DO I HAVE TO BE WITHOUT MY CONTACTS BEFORE SURGERY? Contacts actually change the natural shape of your cornea. In order to achieve the most accurate measurements possible, you will need to discontinue your contacts before your pre-op exam and until surgery. 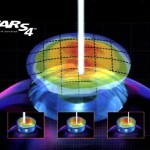 This allows your cornea to relax and resume its most natural shape for the laser measurements. If you wear soft contact lenses, you will need to stop wearing your contacts 2 weeks prior to the dilated exam and until the procedure. WHAT IS THE DIFFERENCE BETWEEN THE TRADITIONAL LASIK AND CustomVue LASIK? The difference between the Traditional LASIK and CustomVue™ LASIK procedures is how we obtain your measurements and how the excimer laser reshapes the cornea. You might consider WaveScan CustomVue™ an upgrade in laser vision correction. The LASIK procedure is essentially performed the same as Traditional. However, the pre-operative work-up differs for CustomVue™ due to the use of the WaveScan machine. During your pre-operative exam, we will use a wavefront analyzer (WaveScan™) to generate a WavePrint™ map which details visual properties unique to your eyes. It is this added technology which creates a customized laser treatment which is then programmed into the laser for your procedure. The actual LASIK procedure is performed identically to Traditional LASIK by creating a corneal flap, reshaping the cornea with the laser, then laying the flap back in place. Recovery time is the same for both types of LASIK. However, CustomVue™ patients tend to have a better quality of vision with less occurrence of side effects such as nighttime glare or halos.